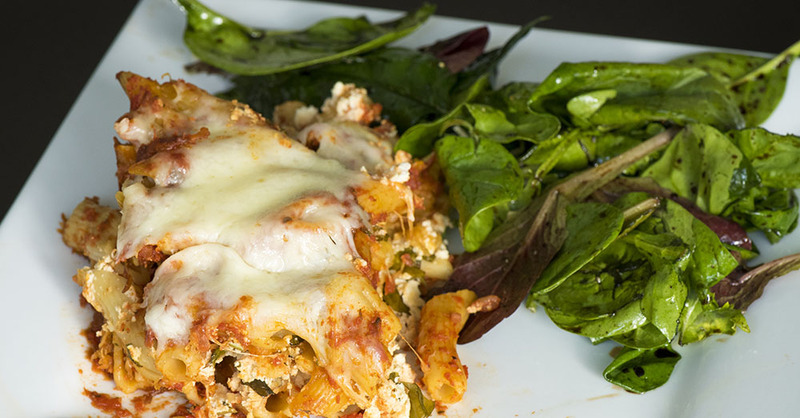 Baked ziti is an Italian-American staple. We love that it’s so comforting, yet full of fresh, herby flavors. We decided to make things a little easier on ourselves and use the slow cooker instead of the oven. The best part is we didn’t have to boil the noodles first – they cook perfectly in the marinara sauce! To brighten up this dish we add fresh basil, rosemary, and lemon juice to the ricotta. And with so much cheesy goodness we decided to leave ours vegetarian, but you could easily add a variety of different meats. After a long day you’re family will love coming home to a hearty helping of this saucy and cheesy comfort food! In a medium bowl mix ricotta, eggs, garlic, rosemary, lemon juice, salt, and pepper until combined, then fold in fresh basil. Grease the inside of slow cooker with nonstick spray or butter. Add about 2 cups of pasta sauce in the bottom of slow cooker. Layer ⅓ of penne noodles on top of sauce, followed by ½ of ricotta mixture, and ⅓ of Italian cheese blend, then repeat all steps so there are 2 layers of all ingredients. Top with remaining penne and sauce, and cook on high for 3-4 hours, until noodles are al dente. Top with remaining cheese and cook an additional 30 minutes, or until cheese is melted through.